Grab your Duck Tape and mason jars y’all! 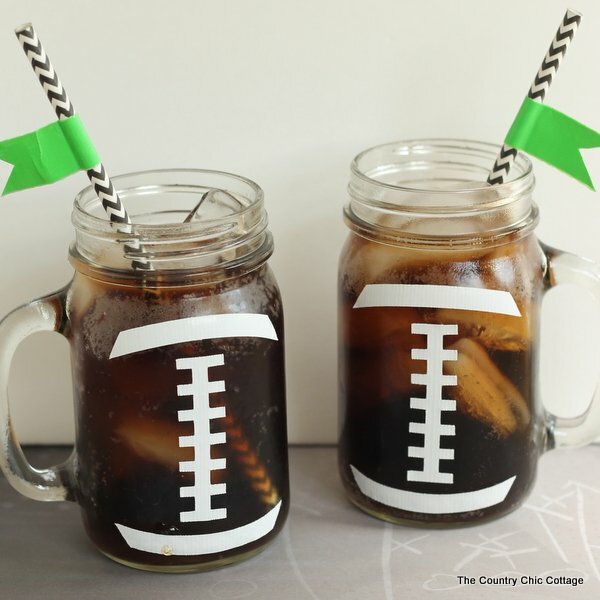 These football party mason jar crafts are the perfect addition to any football party. As a bonus today y’all, you can enter to win a Cricut cutting machine below. 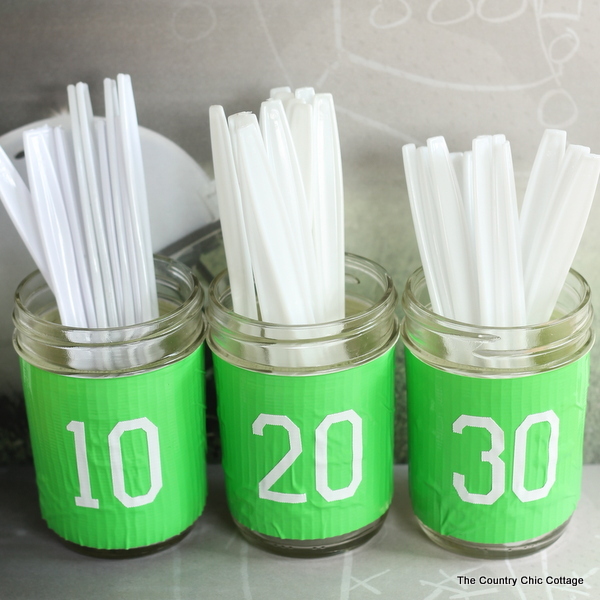 First follow along as I show you how to make both of these football party mason jar crafts. 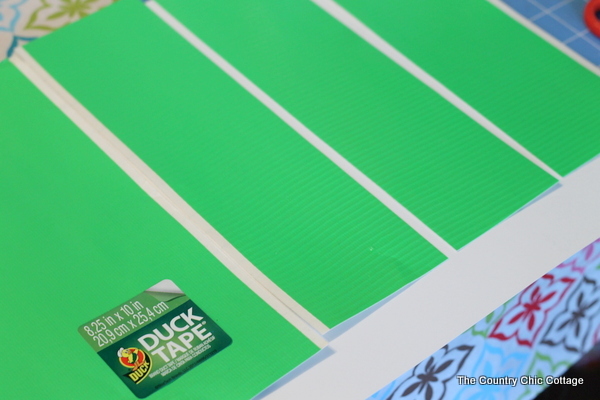 To make the utensil holders you will need a sheet of green Duck Tape and a sheet of white Duck Tape. Yes Duck Tape comes in sheets and it is great for crafts like these. 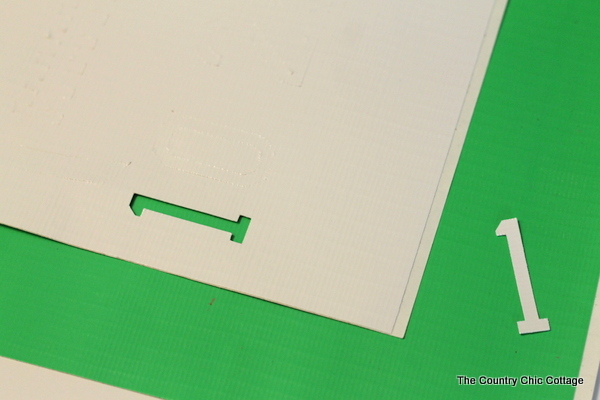 Cut the green sheet into three equal pieces. 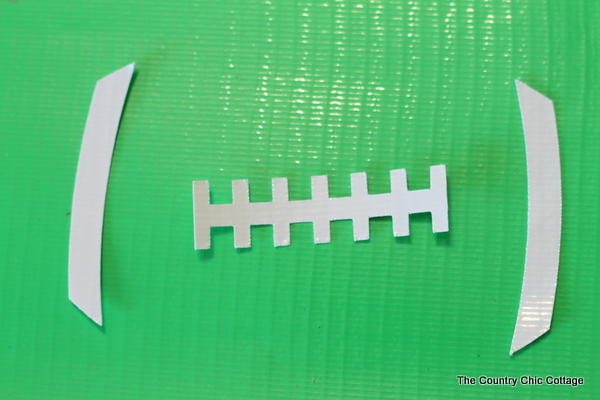 Use your Cricut to cut numbers from the white Duck sheet. 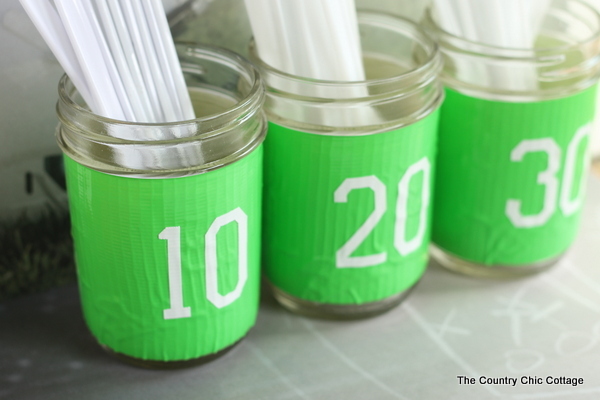 Wrap small jelly jars with the green Duck sheet then add the numbers to the front that you cut with your Cricut. Add in your utensils and these mason jars are ready for your football party. Next is the football mason jar mug. Cut the parts shown below from the white Duck tape with your Cricut. Add them to your mason jar mugs and fill with beverages. You can also put green tape flags on fun straws to complete the look. 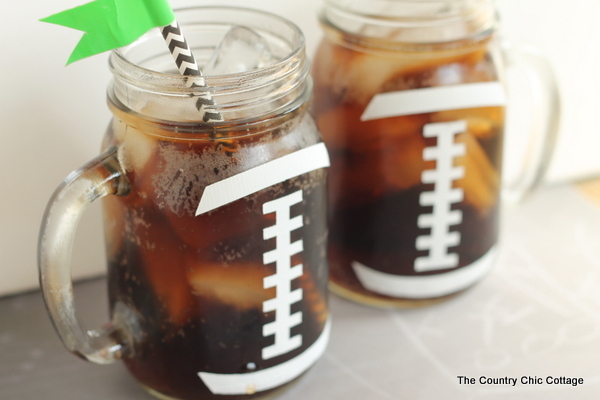 Your guests will love these football themed mason jar mugs at your party. Now I promised y’all a giveaway! 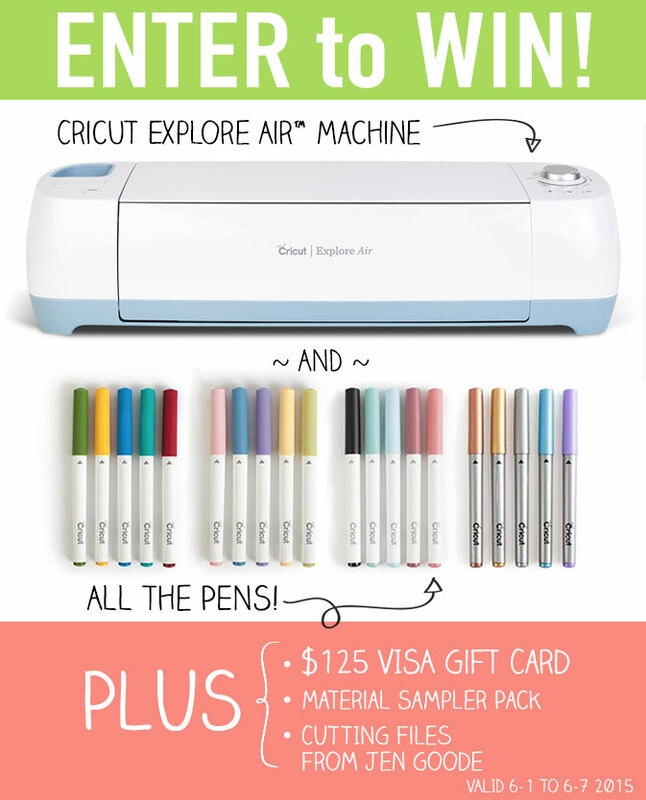 Enter below to enter to win a Cricut of your very own. You will be amazed at all of the fun crafts you can make with it including these fun football party mason jar crafts. And if you would like to see more of the fabulous creations you can make with the Cricut Explore, just click around below to see the craft projects! next post: Southern California Vacation GIVEAWAY! Love doing diy projects and love the Football mason jar one. My son and his family are big sports buffs, this is going to go over big with them. Starting to do projects to keep my mind active since I am a caregiver for my husband who has the early signs of Alzheimer’s. This would help me greatly in doing a lot of projects. Thanks again for considering me. [email protected] says my husband would love these. If I win Cricut I will make for sure. Thanks for chance to win. I have tried for month to win this thing with no unknown well at least I have one more try here. omg I need this machine. What a dream this would be. I am an animal rescue and I make cards sets etc to sell to help fund the sprays of the animals I trap. I trap strays and they go off to another group who puts them up for adoption. I socialize feral kittens and they go to Pet Smart. [email protected]. My iPad changed my spelling. Sorry. Lol. I would love to make a bunch of those mason jar football mugs. We’ve had a Superbowl party every year for over 30 years. These would be a great idea. You could write guests’ name on the duct tape! Just found you today, so glad I did. If I won this, my first project would be for my son’s 30th b-day. Next would probably be for a VA support project. I’m sure it would get plenty of use and I know it would be greatly appreciated. Good luck to everybody! Love this idea! Every Sunday during football season our family does something fun for lunch, and then we hang out to watch the games during the day. This is perfect for our first football Sunday together.